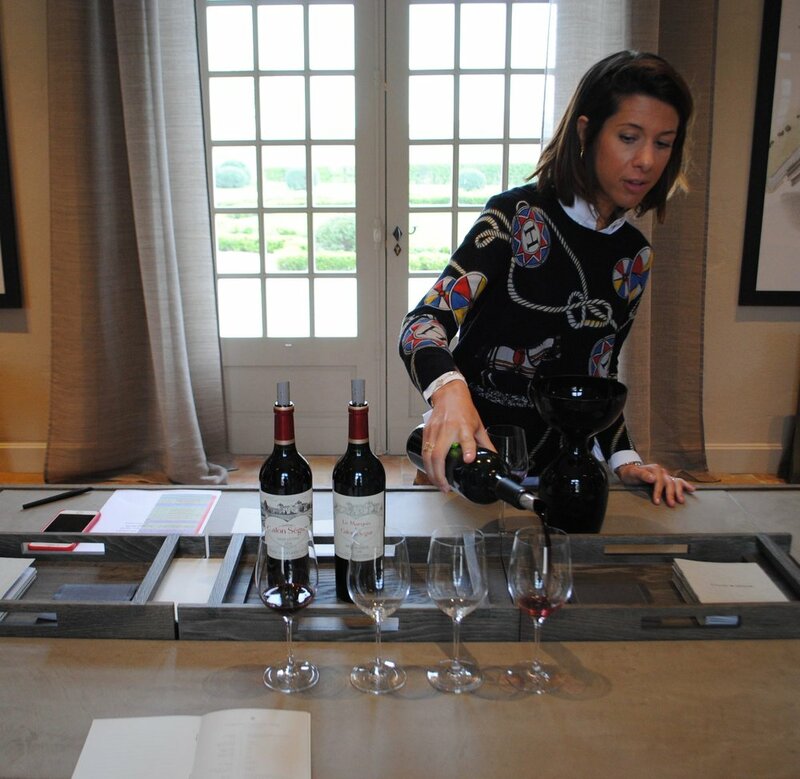 Our first stop was at the great Second Growth and a personal favorite Pauillac property, Pichon Baron de Longueville with Jean-Renée Matignon, winemaker there for over thirty years. After tasting the impressive Château Pibran (we have the 1999 in stock and it’s delicious) we moved onto the third wine of the Château Les Tourelles de Longueville. It is designed to be enjoyed soon, and is made from parcels on the west of the property, right next to Grand Puy Lacoste. How expressive it was! It had spicy red currants and cranberry fruit, licorice and herbs, with plush, firm tannins and excellent freshness. Always a great value in terms of Second Growths, this should be one of the first wines of the vintage you’ll see. The Grand Vin de Pichon Baron was a wine worthy of its status. It makes up fifty percent of the château’s production and is made from 78% Cabernet Sauvignon and 22% Merlot, a classic Pauillac in every sense of the term. It showcased black fruits, minty herbal notes, violets, licorice and minerals with serious freshness, firm but elegant tannins and a lovely long finish. This is a powerful wine that will continue to age gracefully for years to come. The next stop was at Calon Segur, a top property in the rather expansive commune of St. Estephe in the north. The first wine we tried at Château Calon-Ségur was from their sister winery, Château Capbern, an entirely separate property nestled in between Calon-Ségur, Phelan Segur, and Meyney that uses the same winemaking team as Calon. Always considered an excellent value in the appellation, this vintage is going to impress. Loaded with spicy black fruit, mocha and licorice at its core, this elegant powerful wine still has great freshness with firm elegant tannins. Next, we tried the second wine from Calon-Ségur, the Marquis de Calon-Ségur. Calon began a vineyard restoration project in 2012 that aims to increase the amount of Cabernet Sauvignon planted overall, and won’t be finished until 2032. In the meantime, the Merlot that remains to be replanted goes into the Marquis. The result in the 2018 vintage is a wine with pretty, floral red fruit on the nose, a plush, rounded but powerful body and great freshness, herbs and spice on the finish. It achieves great expression but can also be considered rich and will be immensely approachable (and a great value) upon release. The next standout was the perennial great Pontet-Canet. Wow. The only thing more stunning than the château itself was the actual wine. Already expressive with briary red fruit, spice, licorice, cherry and cranberry, it has a plush, ripe feel on the palate and bright acidity to perfectly balance the richness. It’s a wine built to last but already a pleasure to try just a few months after production, an impressive feat in a powerful vintage like this. The finish is long, with notes of mint and herbs. I was quite blown away, and I’m sure it will only improve before its release.